Taste test: These look like regular Ruffles chips. 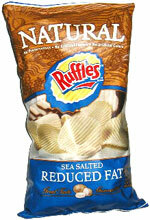 On the taste front, they are slightly less greasy than normal Ruffles, and the sea salt gives a different taste than regular salt. There is a good taste with the salt, making them very good chips. Smell test: Regular potato chip aroma. Trivia: Even though this is reduced fat, there are still 7g of fat per serving.